Handle all your banking transactions including funds transfer, balance check and bill pay from the comfort of your living room with free Internet-based Online Banking. 1st Bergen Federal Credit Union Remote Banking provides a convenient way to transfer funds and check balances by computer, smartphone or tablet. To use Online (computer) Banking or Mobile (Smartphone/Tablet) Banking, you need to first enroll in Online Banking (see below). Click here to begin Online Banking and obtain your Logon. Problems? Contact our Customer Service Center or call (201) 968-0202 Mon-Wed 9am-4pm, Thu-Fri 9am-6pm. Click here to watch the related, educational video on Online Banking. Click here to watch the related, educational video on Bill Pay. 4. Note: If you experience problems, or are asked to provide answers to more than two security questions, contact our Customer Service Center or call (201) 968-0202 Mon-Wed 9am-4pm, Thu-Fri 9am-6pm. As well as on your account statements which are e-mailed to you. What if I don’t have my member number? Call our Customer Service Center at (201) 968-0202 Mon-Wed 9am-4pm, Thu-Fri 9am-6pm. When you enroll, the system provides you with a Logon that you choose. What if I forget or want to change my Logon? What is my Username (Mobile Banking only)? Your Logon, obtained when you enrolled, is also your Username. What if I forget or want to change my Username? 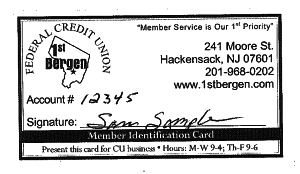 What if I forget or want to change my PIN number on my 1st Bergen Federal Credit Union Visa® debit card? Just come in to the branch at 93-95 Main Street (corner of Main and Atlantic), Hackensack with your card. Our customer service specialists can make any Personal Identification Number (PIN) changes right on the spot. Online Banking makes it easy to manage your finances quickly and securely from anywhere at any time. With Online Banking, you can access your accounts, transfer funds, pay bills, and much more – whenever it's most convenient for you. Online Banking requires a regular Desk or Laptop computer. Mobile Banking requires a mobile device, such as a smartphone or tablet. Can I access Online Banking and Mobile Banking with Apple devices? Yes, both services work on a variety of platforms: PC, Mac, Apple and Android. What can I do with Online Banking or Mobile Banking? Setup automatic deposits, pay bills, transfer funds between accounts, check balances. What can I do at an Allpoint ATM? Wiithdraw cash, check balances, or transfer funds between accounts. Click here to locate your closest location.